It was by sheer coincidence that I decided to read up on the life of Vincent van Gogh while waiting for the Illustration Friday prompt to be posted online today. I'm not sure what inspired me to re-acquaint myself with his life story, but when I saw that the word this week was "star gazer" I knew that an homage to Vincent was in order. Starry Night is van Gogh's most famous painting and one of the most well-known images in modern culture. When I was in high school, I read a biography of Vincent van Gogh that included many of the letters that he wrote to his brother Theo. There's no doubt that I was motivated to read the book because of Don McLean's song "Starry, Starry Night." At the time, I was struck by the tragedy of van Gogh's life and felt overwhelming sadness that he never got to experience the artistic success during his lifetime that came after his death. But today, after reading about his life here, I felt something very different. I felt hope. Here was a man with no artistic training or obvious talent who became one of the greatest artists in history. At the urging of his brother, Theo, van Gogh taught himself to draw and then to paint. And he continued to paint through dark and difficult times when others--himself included--doubted his ability. This makes my heart sing! I love Vincent Van Gogh! I just love this--nice illustration and a wonderful tribute! What a nice homage to Vincent. I just read a couple of months ago a book called "Sunflowers" by Sheramy Bundrick, historical fiction based on the last 2 years of Vincent's life. She took many liberties, as she admitted, but a lot of it was based on Vincent's and Theo's letters so there was a lot of factual stuff and really interesting things about the art he produced the last 2 years. She's an art historian so there were some interesting insights as well. Regardless, it was a good read and made me sad all over again at Vincent's short life. Nice job with both your interpretation of "Starry Nights" and your posting. 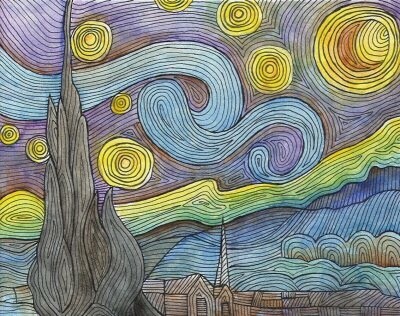 This is a great take on Van Gogh's. It has your style. Your work is simply wonderful. Thank you for the dropping by my blog. HI, I found you through Elvie Studio and am so glad I followed the link. Your blog and art is wonderful. This Van Gogh post is so inspirational. Loved it!